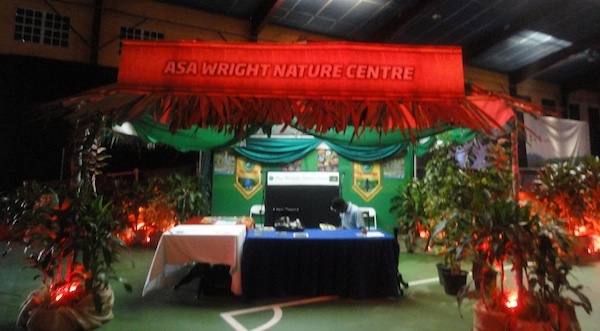 In keeping with our mission to preserve and conserve the forests of the Arima Valley, Asa Wright engaged the attention of the people who will inherit these forests and rivers. 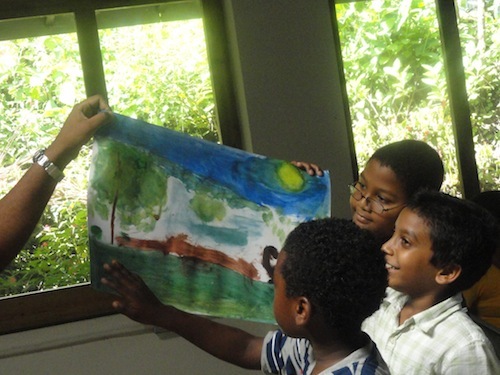 We set up, through July and August, a series of “Camp Safaris”, which groups of children from all over Trinidad attended. 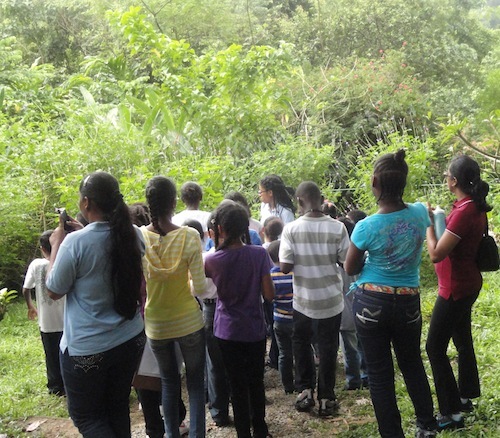 The camps, organized and managed by Conservation Officer Johanne Ryan and Naturalist Guide Richard Smith (both of AWNC), assisted by UWI nature interns Gerana Alfonso and Christiphire Kelly, engaged 302 children and 78 supporting adults. The children showed tremendous interest in what they experienced, and were taught the importance of our natural heritage. Eager, young explorers learned how to identify some of our birds, animals and flowers, were taught how to make sponge paint brushes and were encouraged to paint some of the wonders they had experienced. Camp Safari 2013 will build upon the experiences this year. In the Trinidad forest, the Bay-headed Tanager is a distinct species, sporting its red ‘bay’ head and grass- green body. 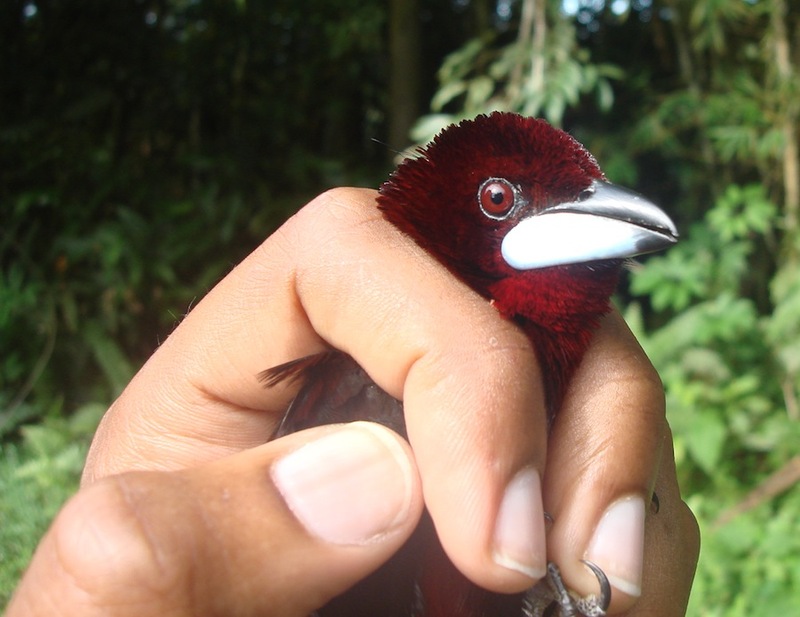 The subspecies, which exhibit variations in plumage, range from Costa Rica to Brazil. Some Tanagers may have blue under-parts while others have grass green under-parts. Some species in Trinidad have green bellies with a bluish tinge. All birds on average are 5.5 inches long. Also named the Tete Cacao, these birds can be found singly or in pairs and even in flocks of mixed species. 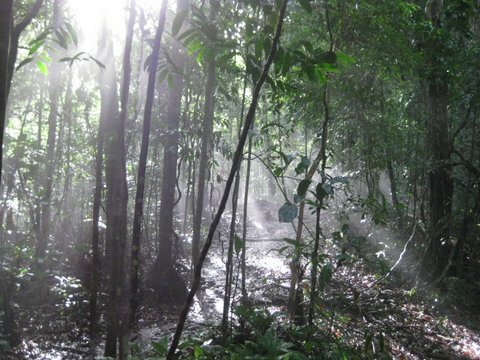 They forage among the mid to upper canopy for fruit. One favourite of the Bay-headed Tanagers at Springhill is the fruit of the ‘Trema’. Less often, the Bay-headed Tanager will forage for insects. The Tete Cacao moves along branches in quick movements, stopping ever so often with its head down seeming to observe the berries for which it is searching. 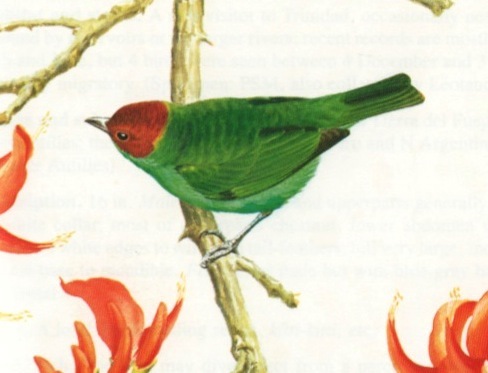 Richard Ffrench described the call of the Bay-headed Tanager as a’ rather slow 5-note sequence, seee, see, see, tsou tsouy, the last two notes lower in pitch’ (Birds, 368). At Asa Wright, you may be fortunate to hear this melody. This painting of the Bay-Headed Tanager was done by Don Richard Eckelberry (1921-2001), a renowned wildlife artist who played a significant role in establishing the Asa Wright Nature Centre. Hilty, S. L. 2003. Birds of Venezuela. New Jersey: Princeton University Press. Ffrench, R. 1991 Birds of Trinidad and Tobago. Oxford:Macmillan Publishers Limited. had enchanted them in their imaginations. Grychel thought the visit was a belated birthday gift for her recent birthday. But on arrival, Edwin realized that was no other place but here to propose to his long time love. And so it was that visitors on the verandah heard a piercing scream from just beyond the feeders! What bird was that? Staff, rushing to check the source, found an ecstatic Grychel hugging her Edwin, and flashing a beautiful ruby engagement ring! The Squirrel Cuckoo mimics the sound of a human whistle- the ‘woop, woooo’ that is sometimes made by males in the presence of an attractive female. It has a large repertoire of calls but the one mentioned above is the most common. This member of the Cuculidae family is an inhabitant of forests and semi-open cultivated areas in Trinidad. Cuckoos stay mostly in the middle to the tops of trees, where they forage for preferred meals in insects and lizards. Our ‘Coucou Manioc’ as it is also called, likes large insects including caterpillars, cicadas, grasshoppers and beetles. Characteristically, the cuckoo darts like a squirrel in trees, its long tail trailing behind it. When flying, it will glide for a short time. Stealthily, it stalks its prey and launches at them at the appropriate time or occasionally sallies for flying insects. The Squirrel Cuckoo has a rufous head, back and long tail with white-tipped tail feathers, red eyes and a greenish-yellow eye-ring and bill. It resembles another one of our species in Trinidad, the Little Cuckoo, except for some distinguishing features. The ‘Coucou Manioc’ is larger (17 inches), has a longer tail and has a pale pinkish upper throat and pale grey lower breast. The Squirrel Cuckoo inhabits Southern Mexico to middle and south America and of course, Trinidad. 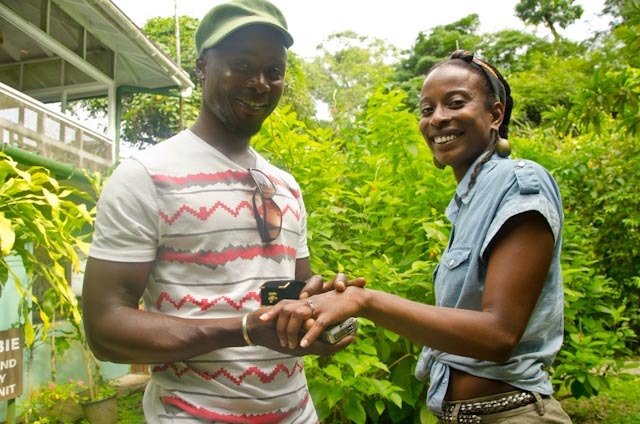 In Trinidad, breeding has been recorded in January, May, July and October. This cuckoo makes a nest out of twigs and lined with dead leaves, 15-40 feet above ground normally. It lays two pale yellow eggs which the male and female help incubate. Both parents also feed the young. Come to Asa Wright Nature Centre in the right season and you may get a live viewing of the endearing Squirrel Cuckoo. 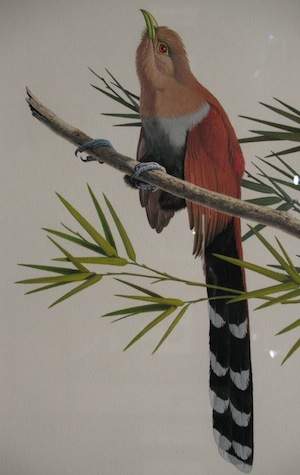 This painting of the Squirrel Cuckoo was done by Don Richard Eckelberry (1921-2001), a renowned wildlife artist who played a significant role in establishing the Asa Wright Nature Centre. Hilty, Steven L. Birds of Venezuela. 2003. 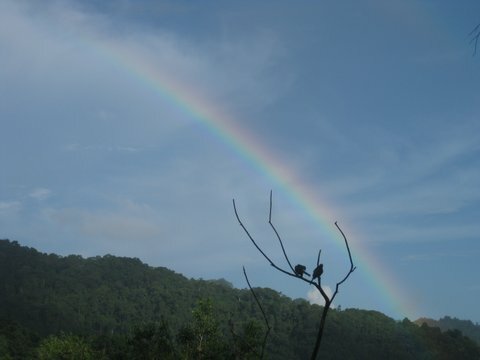 Rainbow against a rain-washed sky. As weather patterns change everywhere, our little islands have also been affected. bitter cold – we are thankful that our changes have been benign…so far! will know, unusual animal sightings have occurred around the estate. pierce the canopy above to highlight that bird, butterfly or flower just as we walk by. there — with rainbows added! 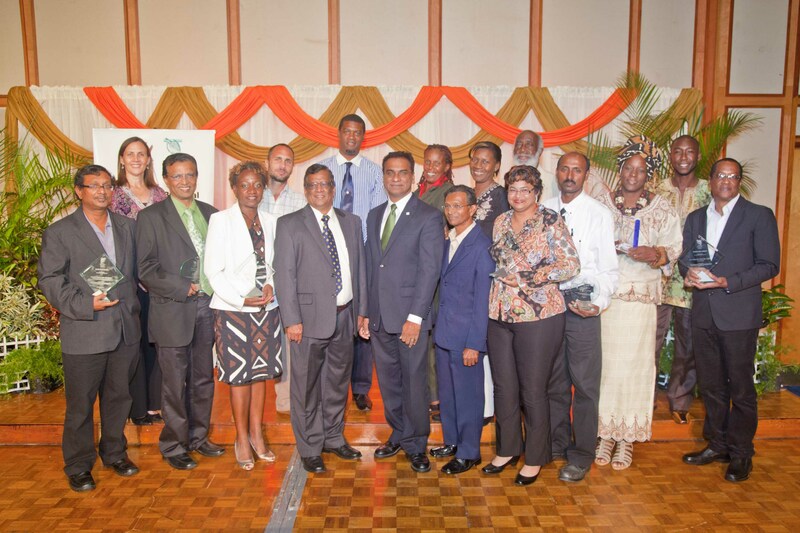 Ann (centre) with former Board member Christine Toppin-Allahar, left, vice president Phil Schaeffer, former Chair Dr. Carol James and Chair Dr. Judith Gobin. Photos by Kenneth Fournillier. When our Lodge Manager Ann Sealy retired in January, her staff members gave her a rousing send-off on the verandah of the main house. However, the Board of Trustees was always aware that they would be honouring Ann for her service to Asa Wright in due course. “Due course” came to pass last month when Board Members gathered at Spring Hill for a Special Executive meeting, and to celebrate Ann. 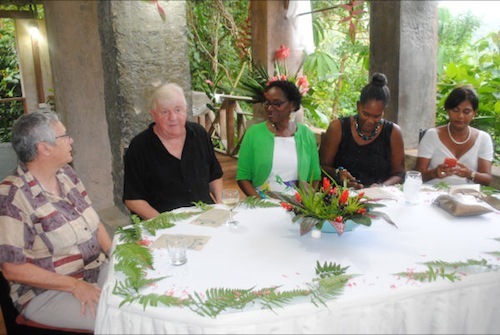 On Friday June 15th, local and overseas board members, and some former board members, hosted a double function in the charming Jade Vine Arbor and then in the dining room to thank Ann for her years of dedication to the Centre. Among those present were Ann’s mother, an employee of Spring Hill in the early days, Ann’s husband Frank and daughters, Deborah, who still works with us and Rachel. 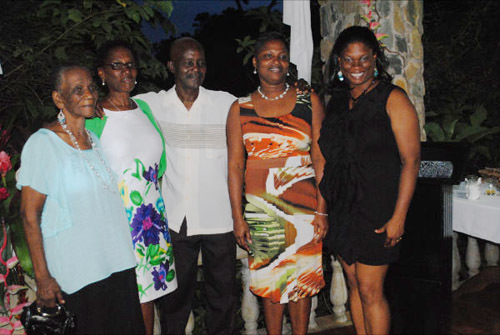 Ann with her family members. Over cocktails and delicious canapés prepared by Events Coordinator Joanne Ramlal-Singh and her staff, guests reminisced over the good times of the past several years. Following an address by former Chair Dr. Carol James, Chairman Dr. Judith Gobin presented Ann with a gift on behalf of the Board of Trustees. 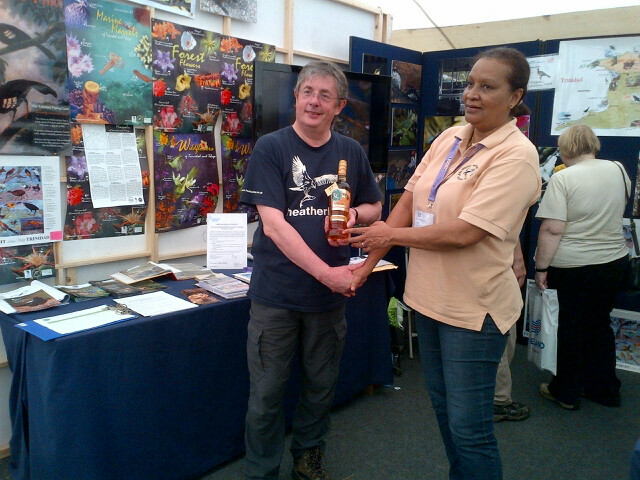 Former Directors Everilde Medina and Rodney De Bhoemler were also presented with gifts of appreciation for their service. 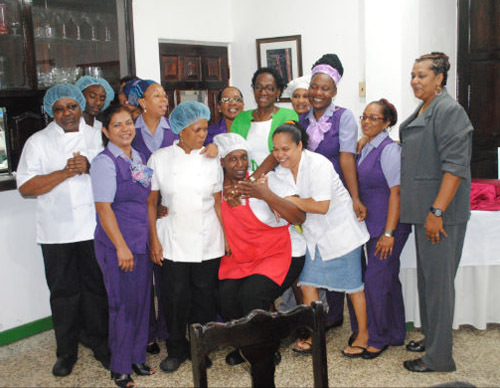 Following an engaging response from Ann, the whole party moved down to the dining room where the Asa Wright chefs and kitchen staff produced a magnificent banquet in honour of their friend and former manager—Ann Sealy. But possibly the highlight – and certainly the surprise of the evening – was when the chefs were called in for appreciation of the evening’s excellent fare. With the diners still applauding the meal, chef Dianne Jeremiah burst into song, and presented us with a moving a cappella rendition of “To God be the Glory”. In a touching moment, Ann rose from her seat to embrace Dianne and join in the final chorus of the hymn. To Ann, the BellBird cries: We have in two short evenings, tried to show you what you have meant to us over the years but it is you who have honoured us far more! Ann, in green top, second row, joins chorus with Dianne Jeremiah in front row, second from left. The iridescence of the Blue-chinned Sapphire can captivate anyone – from the avid bird watcher to the curious young child. As a member of the Trochilidae (Hummingbird) family, it is small, quick, and beautiful of course. The green feathers on its upper body glisten in the sunlight, contrasting with its dark blue tail. In the right lighting, it transforms into a brilliant subject to photograph, and the careful eye may even spot its namesake blue ‘chin’. This species, which is common in Trinidad forests, is also found in northern South America, including the Brazilian Amazon. The feather-covered gem feeds on nectar and only occasionally eats insects. At our own Springhill Estate, it is regularly seen feasting on the nectar of the Vervine (Stachytarpheta jamaicensis) plants in front of the verandah but it feeds on all types of plants – large and small trees (e.g. Ryania speciosa or Bois L’agli), shrubs or herbaceous plants. 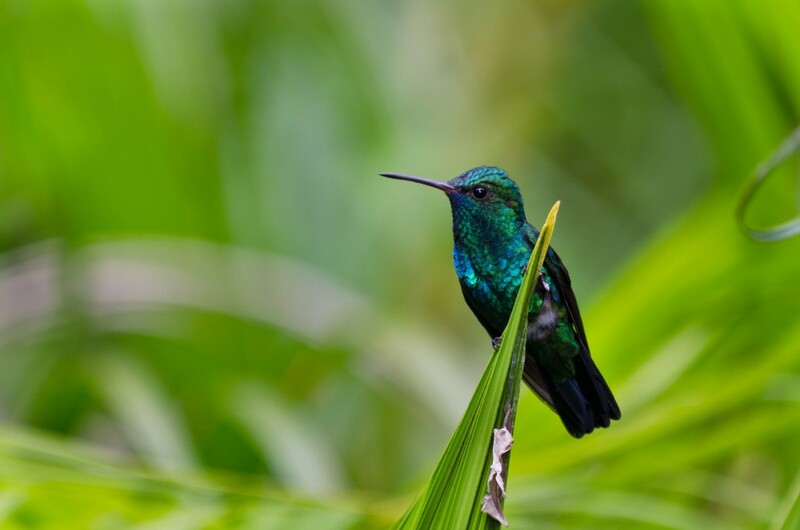 This hummingbird breeds from February to June and normally nests about two to five metres above ground. It makes large, deep cup nests out of plant down and decorates them with lichen. Although not easily heard, the song of the Blue-chinned Sapphire is a set of fast metallic notes of ‘ssssoo, sssoo’. Despite its 0.0889 metres in length, the Blue-chinned Sapphire remains a shining example of the avian fauna that can be seen at the Asa Wright Nature Centre. experts retrieve birds from the mist nets, saw how gently they were handled, and carefully banded and recorded before being released. Caleb reported that the students showed a genuine interest in this “new” exercise, seeking answers to many questions. Ambassador Welters was also very interested in the programme and asked if students graduating from universities in the US could come to Trinidad to work with our Bird Banders for their extra credits. We certainly look forward to further collaboration with the Ambassador and her Embassy. Caleb and Carl each attended a Bird Banding training course at the Klamath Bird Observatory in Oregon, USA, and have worked locally with Klamath Executive Director Dr. John Alexander, who visited Asa Wright, Simla and Brasso Seco earlier this year. 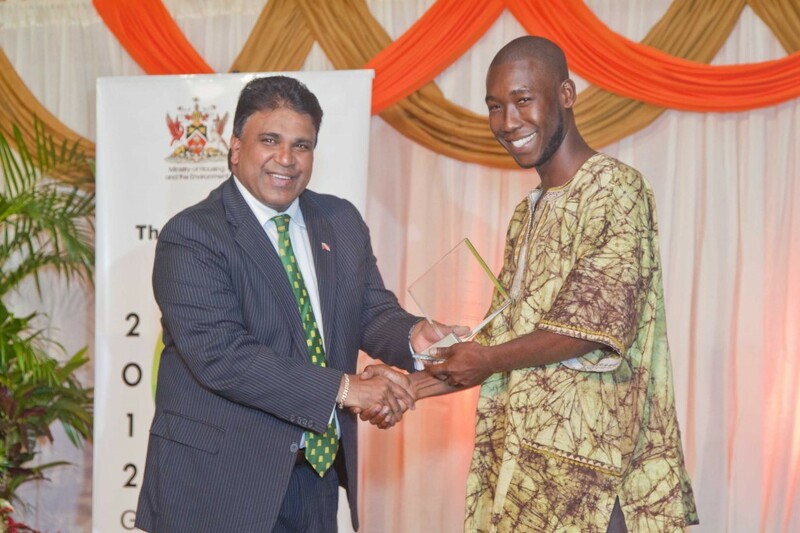 We look forward to Caleb developing a leading role for Asa Wright in the future banding and monitoring of migratory birds travelling through Trinidad. A Silver-beaked Tanager ready for banding.